Note and Credit: The following is an article by Sherman Goldenberg, Publisher of Woodall’s Campground Management monthly newspaper. 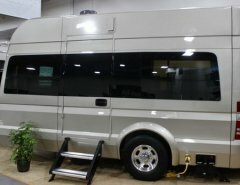 As the industry’s key trade associations await a ruling from the U.S. Department of Housing and Urban Development (HUD) updating HUD’s 30 year-old RV definition – perhaps clarifying the difference between mobile RVs and sedentary housing – the “tiny house” movement continues to grow across the country, including of course, in RV parks and campgrounds. Call them whatever you want, these low-cost, new-wave abodes may become as common throughout the U.S. as they’ve become on reality TV. And, an array of park operators have begun to embrace them as yet another form of alternative accommodation. Indeed, time marches on with or without HUD, the Recreation Vehicle Industry Association, the National Association of RV Parks & Campgrounds, and a range of other organizations scrambling to protect the RV industry’s long-held status as a self-regulating business sector catering to a specific mobile kind of lifestyle product not designed for permanent habitation. Talk, for example, to Robert Drakeford, a former university professor operating eight-year old Oasis Campground in North Carolina’s golf country. Drakeford’s busy year-round, 50-site park includes everything from pull-throughs to geodesic domes to tepee tents and, yes a 312 square-foot custom tiny house. “We always look at future trends”, said Drakeford. “And we began looking at tiny houses. So, we went to a company that manufactures metal buildings that basically you can design to zoning specifications and that building cost us about $5,500 for a 12-by 26 footer. We insulated it and basically put it on blocks and built a bathroom inside of it. And it’s got a futon and a Frontgate bed-in-a-box. We built the whole thing from scratch for under $10,000. And everybody wants to get in it. So, we’re building another one in the next couple of days. It’s really a tiny house, which is part of the tiny house movement, and it blends in with everything else we have”. 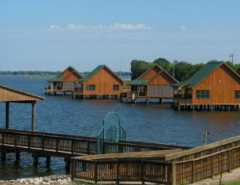 Meanwhile, Greg Batt’s Prizer Point Marina & Resort, Caciz, KY; an elaborate facility with a floating restaurant is in the process of adding a whole section for tiny houses and park models in which customers can locate their own units on an annual basis. Thirty of the subdivision’s 52 sites, situated across the street from his Kentucky Lakes KOA Prizer Point, are already accounted for. He plans to set aside 150 total sites there during the next three years in a world that, he too, sees as rapidly changing. “Yes, it is” said Batts, who’s not real concerned about the specific definitions. “I think a lot of people are looking for second homes – places they can kind of retire to or spend the weekends at and just get away. 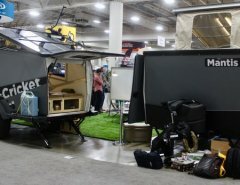 And this is a very economical and friendly way of doing it versus spending several thousand dollars on a condo that’s not really any bigger than a park model camper”.